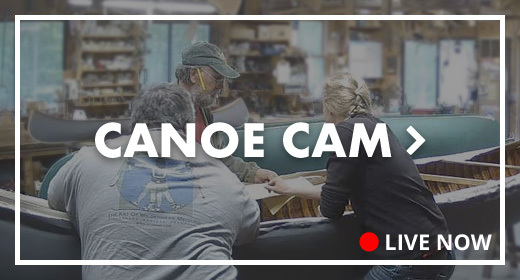 Classes - Northwoods Canoe Co.
For those who wish to have a more hands-on experience with the building/restoration of their canoe, I can offer both group and private classes. All classes accommodate all ages of adults at any skill level. All you need for a class is interest and enthusiasm. I conduct private Building and Restoration classes at my shop in Atkinson. To ensure individual attention, there are no more than two students in any given class. For the building class, the student may choose from among any of my canoe designs to build a canoe that they take home at the conclusion of the class. Cost depends on the model of the canoe built and the length of class time. 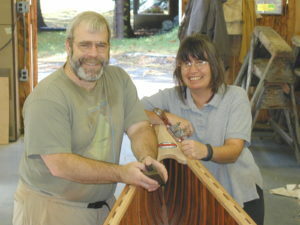 I will work directly with the students to provide instruction and to oversee all their work to ensure a quality canoe. 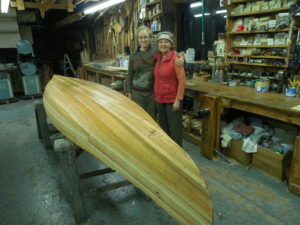 I work on the canoe with the student as much or as little as needed so that it is guaranteed that the boat is finished by the end of the course. 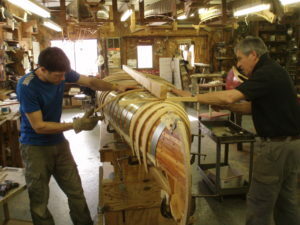 The canoe is completed to the point where the student need only finish paint and varnish once the canoe is taken home. The standard class time is 10 days, which gives the student time for plenty of hands-on experience. 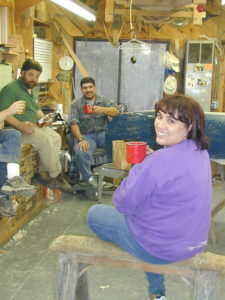 A six-day building class is just enough time to complete the canoe with me working with you all the time. To accommodate the class schedule, many of the materials will be prepared before the class begins. At my shop, the student will experience the full range of wooden boat activity, from unloading lumber, exploring the wide variety of craft at the shop, and deciding whose turn it is to bring in the firewood! The atmosphere is light, friendly and hopefully educational. Shop assistant, Elisa Schine, will be working on normal shop projects and will be available to help us out as needed. The normal workday is from 8am to 5pm with an hour for lunch, provided at the shop. Students will need to provide their own accommodations, breakfast, and dinner. The town of Dover-Foxcroft is about five miles from the shop. There you will find several motels, bed-and-breakfasts and an excellent State Park for campers nearby. Information on these facilities can be sent to you as needed. For all classes, all the materials, hardware, wood, and tools are provided by my shop. Different woods such as mahogany, cherry and oak can be substituted as desired and sail rigs designed at an additional cost. There is no additional cost for any of the shop equipment and tools. The shop does have standard liability insurance. However, as a student, you MUST provide your own accident/health insurance and sign a liability waiver before class begins. Standard safety precautions are taken in the shop and NO student is required to operate any machinery or use any tool that they do not feel comfortable using, or that I determine that they are not qualified to use. It is more important for you to be safe than to complete any single operation that Elisa and I are completely able and ready to complete for you. 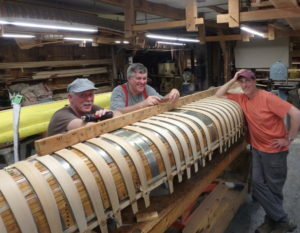 Group classes for building new canoes are taught through the Wooden Boat School at their excellent, sea coast facility in Brooklin, Maine. Most of their classes are held in the summer. They occasionally hold winter classes in various locations throughout the United States. 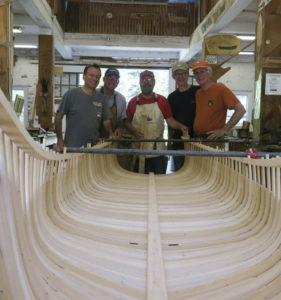 Building a New Canoe group class generally consists of five to ten individuals building one or two canoes in a six-day class. At the end of the week, a lottery determines who will be able to keep the canoe for just the added cost of materials. Private classes are scheduled throughout the year, except June through August. The standard class is ten days, however sometimes a six-day class is needed because of time constraints. A six-day class requires more pre-class preparation and staff involvement, but this can be arranged. No more than one class per month and only one class at a time will be scheduled, unless special arrangements are made in advance. Class schedules can be rearranged with a 30-day advance agreement. A $500 deposit is required 30 days in advance of the start of the class, with the balance due at the beginning of the class. Students are welcome to bring a helper or assistant for an additional $400. Restoration Classes $2,300 (plus cost of materials). This is an estimated figure and all prices are subject to change. 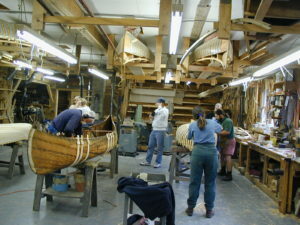 All group classes are scheduled and fees set by the Wooden Boat School, Box 78, Brooklin, Maine 04616. Contact them at 207-359-4651 for a complete brochure on these and other wooden boat building classes.